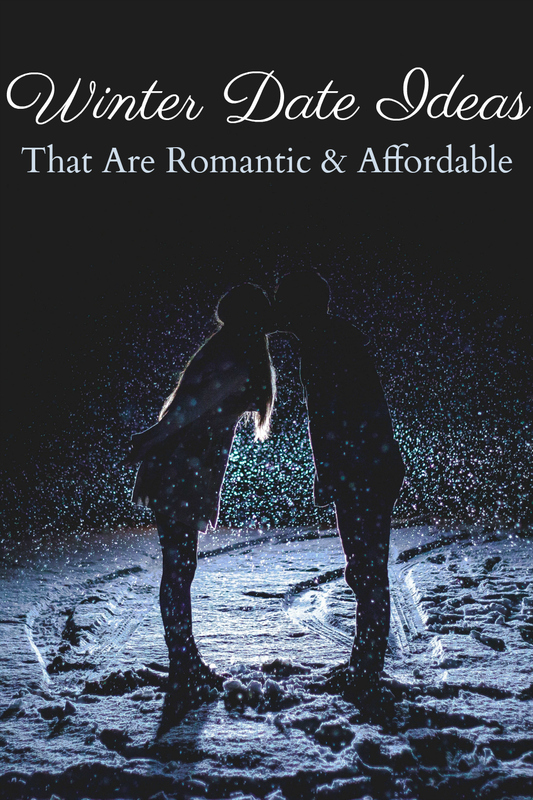 These affordable winter date night ideas are perfect for cold weather and small budgets! Focus on each other and have fun! It might be freezing outside, but don’t let that stop you from having fun. Laughing together makes you fall in love all over again. Make it a point to step out of your everyday routine and do something different, which can be as simple as going to see a free show instead of looking at your computers or phones all day. Work your way through my list of winter date night ideas, and keep the fire alive – making sure you steal plenty of kisses along the way! While most of these can be done for free, some will cost you a little out of pocket. One of my favorite tips is to have a “date jar”. Put any extra change and small bills in it through the week, and then use the next time you want to have some fun. Alternatively, you can have $10 or $20 automatically drafted out of each paycheck to a separate “fun” account. Get creative and have fun! For example, when you cook together, challenge yourself to only use what you have and save a trip to the store. The real point is to focus on each other, put down your phones, reconnect, and keep that spark alive! Couples who laugh together have healthier happier relationships! Museums: Many museums offer totally free admission and events. This information can usually be found on their website. Volunteer: There are a plethora of ways to volunteer locally. Contact some local nonprofit organizations, and give back to the community together. Movie Night at Home: Gather up your favorite chick flicks and his favorite action movies for a fun movie night in snuggling on the couch or in bed. Take a Class: Look for cooking classes in your area. They’re often very affordable, a great way to meet people, and learn some new skills. My husband and I have taken a few at our local Whole Foods and always have so much fun! Go Out, On the Cheap: Sign up for the mailing lists of your favorite restaurants. To show their appreciation, many will send you great coupons. You can also check your local Groupon deals for savings on dining, entertainments, and local events. Pajama Party: Ask your closest friends to come over in their pajamas, bring a dish, and play games. Sometimes, keeping it simple is the most fun! Board Games: Go old school with Monopoly, or break out fun new games to challenge your board game skills. Card games are another fun way to enjoy each other. Cook Together: Turn on some music and cook up something new or one of your favorite restaurant dishes at home! To make it more challenging and fun, don’t go to the store and commit to using what you have on hand. Indoor Picnic: Gather everything you cooked, and create a romantic picnic on the floor, maybe in front of a fire. Be sure to include plenty of pillows and blankets for snuggling afterward. My sesame spaghetti, easy goulash, or flourless brownies are all perfect! Have a Drink: Brewery tours are a ton of fun and very affordable, and many local wineries do wine tastings for a free or a minimal charge. Go Dancing: Look for line dance lessons (my personal favorite) or go where they’re playing your favorite music and show off your moves! Both are perfect winter date night ideas, and a little movement is always a good thing in the winter when we all tend to be more sedentary. Look at Pictures: Pull out the old picture box (and a box of tissues), and reminisce over your favorite memories. Bonfire & S’mores: Stay warm next to a backyard bonfire, and roast up hot dogs and S’mores. Go Hiking: Even when it’s cold outside, you can still bundle up and go for a hike. 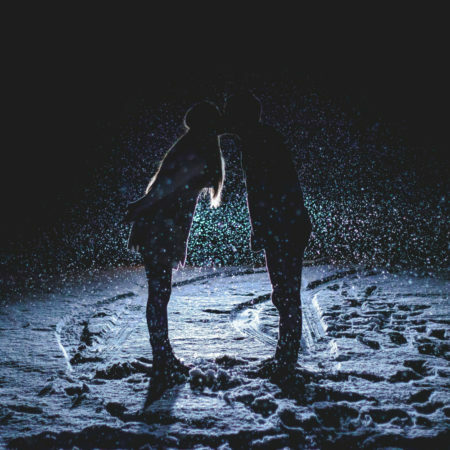 Stop along the way to steal a kiss and play in the snow! Be a Tourist: Head out to all the local tourist hot spots for a day or night of adventures. My husband and I love playing tourists in our own town! Stargazing: Snuggle up under the stars and guess which stars and planets you are seeing. Go to a Bookstore: Used book stores are the perfect place for finding hidden treasures, especially if you’re a couple who loves to read. Look for vintage, first editions or just fun and funny books. Scavenger Hunt: Create an indoor scavenger hunt for each other and have fun trying to find a hidden treasure. Go Sledding or Skiing: If you live in a snowy area, grab the kids sleds and go sledding. If you are near a ski resort, you may be able to head out to ski depending on your local resort options and fees. Play in the Snow: Grab the gloves, jackets, and scarves and create a fun snow fort that will keep you busy for hours afterward snuggling to get warm again. Karaoke: Sing along at home, or hit up your local karaoke bar to compete with other locals. Puzzle: Pour a glass of wine, turn on some music, and do a puzzle together. Amazon has tons of cheap options. Take in a Show: Here in Nashville, you can find free music playing just about any night of the week. Eat before you go to save money. Video Games: Video games aren’t just for kids! My husband and I have a few favorites that we love playing together, and many online are totally free.